Diminishing returns are the name of the game when it comes to surprise revelations from yesteryear, particularly for someone like myself who's been peering under many a rug from virtually every nook and cranny in the bygone, American alt-rock landscape. Nonetheless, I still make a handful of pleasant discoveries every year, and one of the finest entries of the 2012 contingent arrives from Detroit in the shape of The Orange Roughies, whose 1989 album Knuckle Sandwich comes paired on CD with an entirely unreleased LP, Spilling True Love Everywhere, originally tracked in '91. Even after multiple listens, it's tricky to discern the root of the Roughies charisma and mystique, but I suppose a good place to start would be with vocalist John Pineau who possesses a timbre reminiscent of Peter Murphy not to mention a smidgen of Paul Weller, but such Anglophile resemblances are likely coincidental. Six-string wrangler, David Feeny is a spectacular asset as well, peeling off cutting guitar leads a la Pylon's Randall Bewley and The Edge circa The Unforgettable Fire. 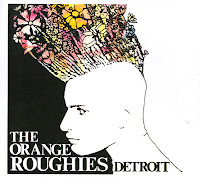 The Orange Roughies' encompassing sonic aesthetic often amounted to an intoxicating negotiation between Echo and the Bunnymen and Let's Active...or on second thought, make that the Chameleons UK by way of late '80s REM. Heck, both of those tasty propositions apply to one extent or another, yet this Motor City quartet weren't derivative so much as advanced. "Knuckle Sandwich" (culled of course from the album of the same name) along with "Eyepatch" and "Pure and Simple" are dense latticeworks of ambitious arrangements wherein indelible chorus hooks and ringing chords give rise to sublime and stirring post-punk arias custom fit for the 120 Minutes generation. Perhaps not life altering, Knuckle Sandwich still boasted enough razzle dazzle to outdo the bulk of the band's peers. I should also add that the killer remastering job goes a long way in turning these already resonant tunes into something downright seismic. The not quite as beefy Spilling True Love Everywhere tracks manage to bask in a melodious glow of their own with "She's Trippin" and "4 Quarters" providing ample evidence that O/R were on a roll, a grand one in fact, that would unfortunately come to a halt in the summer of 1991 when Pineau opted to go back to college. At the very least, the music still lives and sounds better than ever (incidentally, Detroit was marked with an album release party of sorts this past May 5th, with a reunited Roughies sharing a bill alongside the Junk Monkeys and Hippodrome). I'm sharing two songs from the album below to whet your psyche. CDs are available from Gangplank Records and CD Baby. CD Baby is also offering Detroit digitally, as is Amazon Downloads. could you reupload the song please?